Goal Setting: All successful people set goals. Without any specific goal, we achieve less than we can. It is important to set challenging and realistic short-term goals to reach our long-term goals. The fear of failure reduces our learning performance. We should accept that making mistakes is a natural part of the learning process, which shows that we are taking appropriate risks. Learning does not occur without taking some risk. Motivation: Our leaning motivation energizes and determines the nature of our learning behavior. It is critical to keep this source positive and alive by coping well with failures and disappointments. Regulating our emotions to boost our self-confidence, reminding ourselves what success and failure mean through explanatory and constructive self-talk, and using effective reinforcements to sustain our efforts are among many adaptive motivational strategies we can use to keep learning. Resource Management: While learning we need to organize all our internal and external resources in a way that works for us. Being organized sounds easy but it is hard to achieve. It involves eating healthy, getting enough sleep, making weekly flexible plans, finding the right places to study, conducting effective group study sessions, and seeking help from professors. You can get better at organizing your resources by tracking your success with the strategies you try and making necessary changes when something does not work for you. Attention and Memory: A large portion of learning is an outcome of effective cognitive activities such as paying attention to the material presented. We can improve our learning performance by using strategies to improve our attention, trying different ways to better embed the learned material to the long-term memory and finding easier ways to access the knowledge we need, when we need it. Cognition and Metacognition: Metacognition is an expression we use to refer to the awareness and control learners have over their learning process. 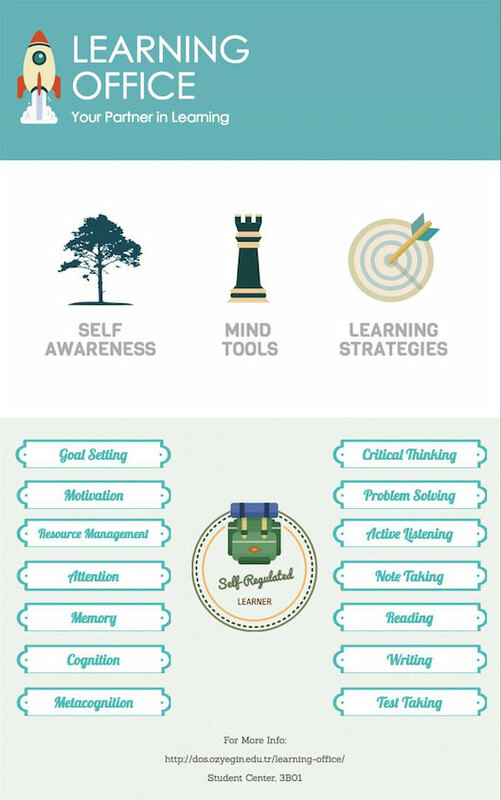 Being aware of the important factors affecting our learning can improve our performance. Reviewing the material beforehand, asking questions to ourselves and others, and creating mental or real pictures of the material are some strategies that can improve our metacognition. Critical Thinking: Critical thinking is the skill to use the acquired knowledge in flexible and meaningful ways. If you accept everything you read or hear to be true, if the things you read do not lead to some questions in your mind or urge you to investigate from other sources, and if you do not evaluate a claim you encounter by asking “What is the evidence?” you probably are not a good critical thinker yet. You can improve this skill by exploring the principles of critical thinking and practicing it regularly. Problem Solving: Problem-solving is the act of moving from the state of not knowing how to complete a task to the state of being able to complete it. There are various types of problems and solutions strategies: The solution strategies for the concrete problems we encounter in most tests are different from the strategies for more loosely defined problems for which not everyone can agree on one solution. Similar to critical thinking, you can improve your problem-solving skills by examining and applying its principles. Active Listening & Note Taking: Note taking is an essential skill required for academic achievement in college. Taking notes helps the material to be represented both mentally and physically. Paying attention to both the process (how we take notes) and the outcome (the neatness of the notes) is important for this skill. Reading: Most students pick the wrong places for reading, read in a hurry to finish the text as soon as possible without being aware of how much they really understand. We can improve our reading skills by adopting the behaviors of a good reader such as creating the right environment, setting reading goals, asking questions and interacting with the text. Writing: Good writing starts before the actual writing. We can improve our writing skills by finding good resources, adopting good pre-writing strategies, using effective strategies to translate your ideas into text, and revising your text multiple times after writing. Test Taking: Not all tests are created equal. Each requires study strategies specifically aimed at their purpose and structure. Preparing for a multiple-choice test, for instance, should be different from preparing for an essay test. Test anxiety is a significant barrier in the way of successful performance on a test. A good way to deal with it is to understand the underlying reasons well and taking necessary precautions to avoid it. Source: VanderStoep, S. W., & Pintrich, P. R. (2007). Learning to Learn: The Skill and Will of College Success. Pearson/Prentice Hall.